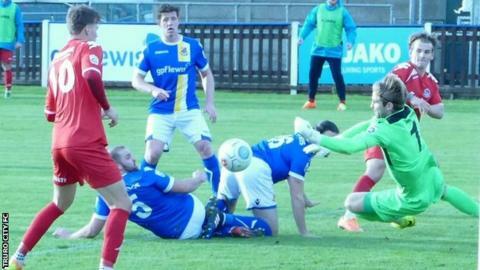 Truro City boss Lee Hodges says his side must try to build another winning run after a first defeat in 10 matches. City were beaten 2-1 at Wealdstone in National League South as they lost for the first time since the end of August. Truro's run saw them become the first Cornish club to make the FA Cup first round since 1969, and put them top of the sixth tier for the first time. "We have to start again because we've enjoyed winning games of football and working extremely hard," he said. "Their keeper was on fire, whatever we threw at him he made some unbelievable saves," added Hodges, whose side were 2-0 down before Tyler Harvey pulled one back. "Two mistakes by us gave them the goals and we created the better chances - we scored one that was offside, which was dubious, and we had a couple of good chances. "Second half it was one-way traffic, we created chance after chance but their keeper got something on it."